With the landmark passing of Republic Act No. 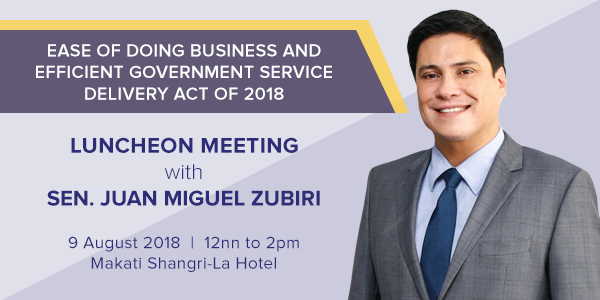 11032, otherwise known as the Ease of Doing Business and Efficient Government Service Delivery Act of 2018, the ECCP and EPBN recognize the pivotal role of the Senator Zubiri in this endeavor. As such we have invited him to speak at our upcoming Membership Luncheon Meeting to address ECCP members on the most recent developments after the law’s enactment, provide updates on other measures being taken such as Senate Resolution 73 and the still pending 11th Foreign Investment Negative List, and provide an outlook of other legislative priorities to further promote a more conducive business environment and improve the country’s competitiveness among ASEAN and regional neighbors. ** No shows will be billed at full cost. Cancellations must be made at least 48 hours before the event.